Oculus VR CEO Brendan Iribe says the challenge of developing quality virtual reality experiences for mobile devices is right up Carmack's alley. John Carmack, as part of the id Software team, made Wolfenstein 3D. He made Doom. He made Quake. He is an undisputed and unparalleled genius of the code who almost single-handedly created the most dominant videogame genre of all time. So why is Oculus VR, the company that lured him away from id Software, wasting his talent on mobile devices? "There's a big challenge there. That's the kind of thing that a guy like John Carmack loves to sink his teeth into and pull something off there, something where people look at it and say, 'How is that possible?'" Iribe said in an interview with VentureBeat. "Tim Sweeney was quoted recently at the Doom anniversary, talking about when he saw Doom in 2.5D. He didn't know how that was possible at the time on such a low-end computer," he continued. "That was a bit of what Carmack was known for. He and his group are very focused on the mobile side. We are throughout the company, but he's spearheading a lot of that mobile work. We can't give any details on it, but so far, from the glimpses we've seen, we're going to see another 'How did he make that work?'" 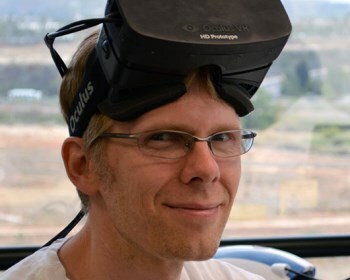 Carmack became the chief technology officer at Oculus VR in August, although he didn't leave id Software behind until more than three months later. Despite his executive-sounding title, Iribe also revealed that Carmack is a "head-down" guy who works remotely from Dallas with a handful of others, while most of the Oculus engineering team is in California. "We're trying to respect his wishes, where he wants to get in and code and solve these problems on such a small platform," he said. "To do that well, he needs to focus and have his isolation. That's what he's doing."